I have been to Los Angeles once before on my trip to San Francisco but never actually went outside of the airport at LAX. I always wonder what it is like besides my preconceived idea of a metropolis with mad rush hour traffic, beautiful people and polluted air. 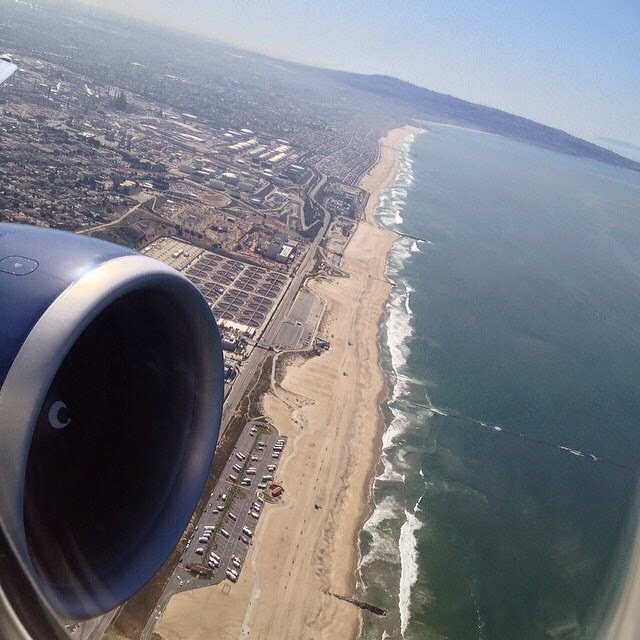 Lately I realized that the best thing about flying in and out of Los Angeles is the airport's location near the ocean which means you get to fly over downtown and the beach so if you are departing/arriving during the day I would suggest you book a window seat to take pictures (lots of it!) while drinking coffee and a side of jet fuel. 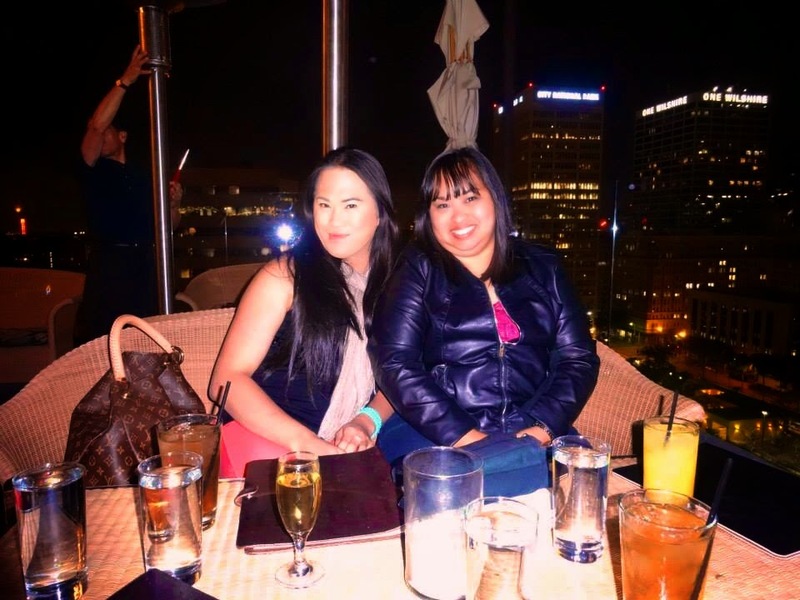 I finally decided to visit my friend Janie in Riverside, CA together with Celle and Wendy. 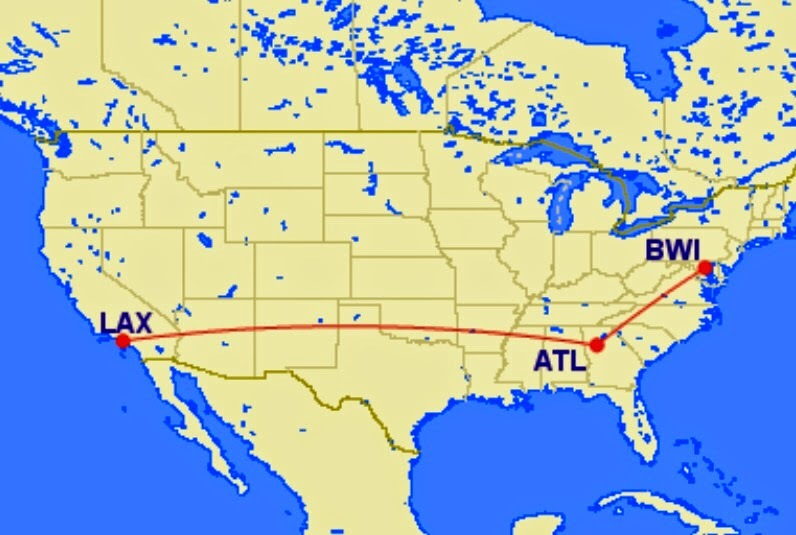 I booked my one-way Delta flight from Baltimore (BWI) to Los Angeles (LAX) with a layover in Atlanta (ATL) because I wasn't sure at the time if I will be returning from LAX or Sacramento (SMF) since I will also be in Northern California immediately after a five-day vacay in LA. (yep, you read that right!) I ended up flying back from San Jose (SJC) but I will talk about more of that on another post. 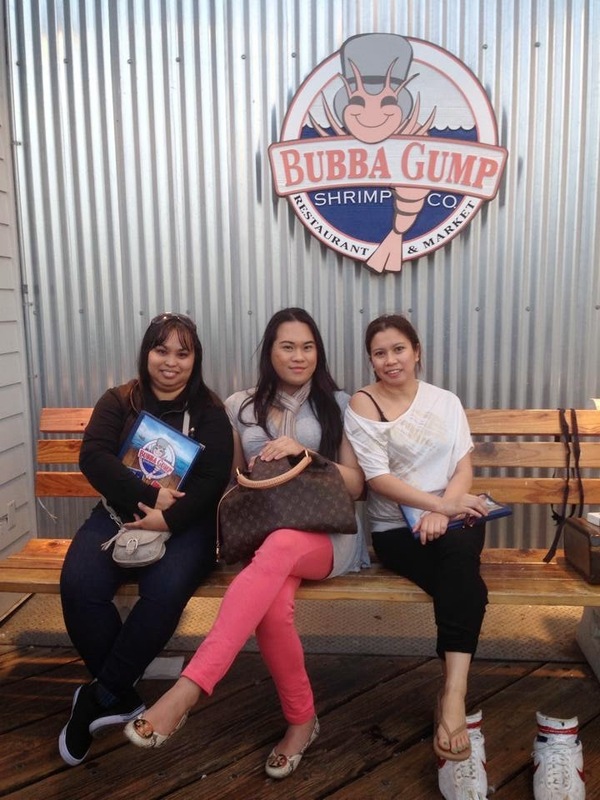 Mar-28: Our first stopover was in Santa Monica Pier which was featured in movies and TV shows like Private Practice, etc. We took pictures of the sunset, the beach and everything else. Every time I visit a new place I always buy postcards to send to friends around the world and a shot glass for my growing collection. There are plenty of souvenir shops, restaurants and kid-friendly rides along the pier. 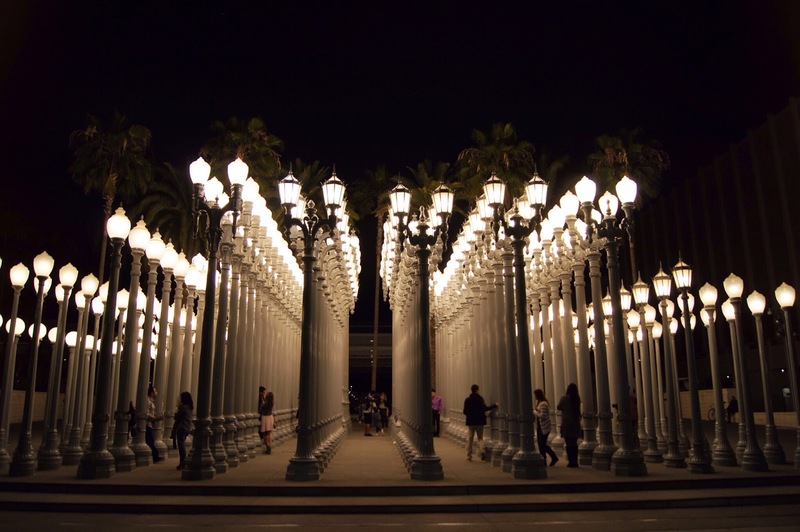 We had dinner at Bubba Gump Shrimp Co., inspired by the Tom Hanks movie Forrest Gump and then afterwards drove to see the Urban Lights at Los Angeles County Museum of Art (LACMA). Waiting for our table at Bubba Gump Shrimp Co.
Mar-29: Janie got us discounted Disneyland Resort tickets (SoCal resident) to visit both theme parks in Anaheim, CA. We went to Disney California Adventure on the first day and rode on California Screamin', Mickey's Fun Wheel and Grizzly River Run without having to wait long lines thanks to Fastpass! Unfortunately, we waited more than three hours for the popular Radiator Springs Racers in Cars Land because the Fastpass was no longer available. Was it worth it? Maybe. 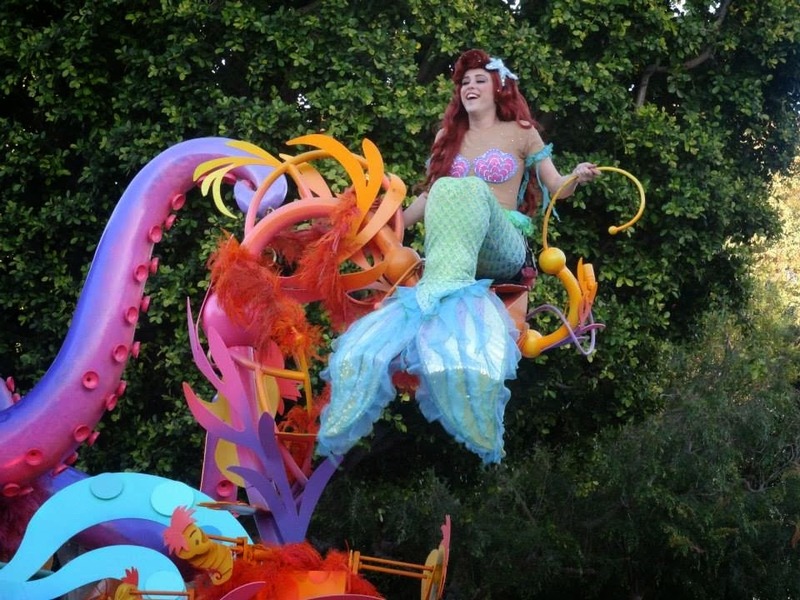 Then we sat and watched the Pixar Play Parade featuring floats and characters based on the Disney-Pixar films Cars, The Incredibles, Toy Story, etc. Mar-30: The next day we went to the second theme park Disneyland and rode on Space Mountain and Big Thunder Mountain Railroad. It was more crowded here than in California Adventure. We did not really stay at the park most of the day since we were in and out a lot. We went out to grab lunch at Kapit Bahay in Anaheim for our Pinoy food cravings. Then we went back to watch the Disney Parade, went outside to do last minute souvenir shopping at Downtown Disney and finally back again to watch the fireworks outside Sleeping Beauty Castle. Due to the wind advisory, the fireworks display was cancelled for the night so we watched Fantasmic! instead. Mar-31: We drove to Palm Springs, CA to take pictures of the wind turbines and the statue Forever Marilyn. I honestly could not count how many wind turbines there are in Palm Springs. It was truly overwhelming. According to Wikipedia, there are over 3,000 units in operation. It was very windy out there so it only made sense to use wind turbines. Later that afternoon we rode on the Palm Springs Aerial Tramway up the mountains before driving back to Los Angeles for our dinner reservation at the Perch. I first discovered Perch when I was reading my Louis Vuitton City Guide - Los Angeles. It is a rooftop lounge surrounded by the city's skyscrapers with live music for your entertainment. So if you are ever in Los Angeles you should definitely check it out! Apr-1: Janie and I got a total of five confirmed priority seats to The Voice so she invited her friend Ayen to go with us to Universal City, CA. We arrived at Universal Studios around eight in the morning but did not actually get seated inside until after one in the afternoon. Janie has been to multiple The Voice shows but for us (me, Wendy, Celle and Ayen), it was our first time to be there. The only downside to this amazing experience is the fact that our cameras and mobile phones were not permitted inside the studio which was no big deal plus we were sworn not to post, tweet or text anything about the show until the episode aired on NBC the following week. I was just happy to be there and to finally see Usher, Shakira, Adam Levine and Blake Shelton in person. After The Voice, we went to the iconic Hollywood sign. Apr-1: We missed Malibu from our itinerary due to our busy schedule for the last couple of days so maybe we will do that next time. Luckily we didn't miss my favorite house in the world The Halliwell Manor. I grew up watching Charmed so when I saw it in person I felt nostalgic and accomplished at the same time. The Halliwell Manor is actually located in Angelino Heights in Los Angeles although in the TV series it was fictionally set in San Francisco. I love that the house was just as I imagined it in Charmed. By nighttime, we went to the Hollywood Walk of Fame for our last adventure.